It’s no wonder that concrete is one of the most popular construction materials in use today. Concrete is solid, moldable, versatile, affordable, attractive and, when properly made and poured, can last for decades with minimal maintenance. 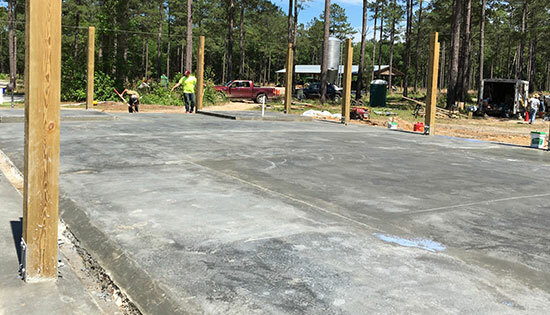 While there’s no shortage of concrete contractors in Savannah and the Carolina Lowcountry, only Donald Rushing Construction stands out as the area’s preeminent structural concrete contractor. The Donald Rushing Construction Company is known throughout the area as being among the top concrete contractors in the Coastal Empire. Our combination of skill, expertise, and reliability is hard to beat, and can ensure you make the most of your construction funds. Donald Rushing has served Savannah and the Carolina Lowcountry since 1987, and has built an unparalleled reputation by delivering hundreds of projects to the satisfaction of its clients. With so many upstarts in the contracting game, it’s important to select a contractor with a proven track record over decades. Unlike many some operations that only handle certain aspects of concrete construction, Donald Rushing manages the entire concrete construction project from beginning to end. Design, site prep, pouring, rebar installation, cleanup, and more. By providing all these services in-house Donald Rushing offers a far superior value than hiring several separate groups. Another advantage to picking a single source contractor is that you’re far more likely to see your work completed on-time and on-budget. In situations where several contractors are involved, all it takes is one being unable to fulfill their end of the project and suddenly everyone is unable to proceed. With one contractor overseeing the entire project, it has a much better chance of being completed when needed. Donald Rushing can go beyond concrete to meet your needs on large projects. We can handle a wide variety of construction needs, or work as contraction managers, handling the coordination of contractors for start-to-finish completion of projects such as office buildings, chemical plants, or industrial plant additions.